BAFTA tribute to Downton Abbey Jump to media player The cast and crew of the hit drama Downton Abbey have been presented with a special award by BAFTA, as they film their final scenes. Downton actress in plea for Syria children Jump to media player Downton Abbey actress Laura Carmichael visits Lebanon's Bekaa Valley to highlight the plight of Syrian children refugees. The Duchess goes to Downton Jump to media player The Duchess of Cambridge is making one of her final public appearances before she gives birth to her second child. Bonneville: Bears, Obamas and the BBC Jump to media player Actor Hugh Bonneville tells Andrew Marr about the spice of Nicole Kidman, the future of W1A and the past of Downton Abbey. Carter reads Sassoon on Remembrance Sunday Jump to media player Downton Abbey actor Jim Carter reads Siegfried Sassoon while musician Steve Knightly and his Show of Hands band performed on the Andrew Marr programme. 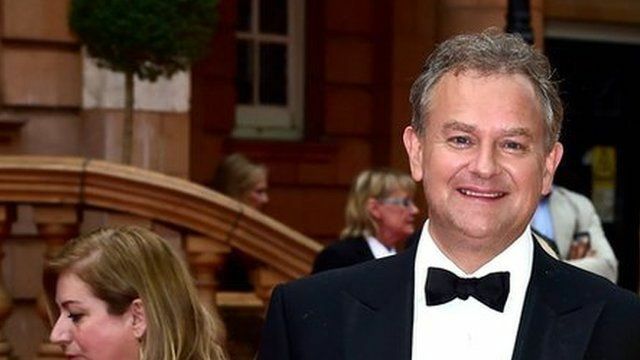 Downton Abbey star meets 'double' Jump to media player Downton Abbey actor Hugh Bonneville has been modelled into a waxwork for the Madam Tussauds collection in London. Britain 'becoming like Downton Abbey' Jump to media player The leader of Britain's trade union movement has warned of creating a "Downton Abbey-style" society in which social mobility "has hit reverse". Starched collars revived at laundry Jump to media player A Bournemouth laundry has revived the art of producing a starched collar, thanks to film and TV productions including Downton Abbey. The cast and crew of the hit drama Downton Abbey have been presented with a special award by BAFTA as they film their final scenes. The last episode will be shown on Christmas Day, but the writer Julian Fellowes says he is considering making a Downton Abbey film.